Minneapolis ECFE Parents Council: Make Gingerbread Houses at Home! 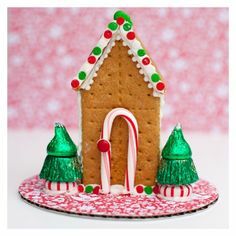 Make Gingerbread Houses at Home! We won’t be hosting a gingerbread house-making event this year, but that doesn't mean that the gingerbread-based fun has to stop! Just follow the instructions below to have fun building a gingerbread house with your children at home. Sturdy plate for the base. Take your plate and squeeze a dollop of frosting where you'd like the house to be. Set the Half & Half carton on the frosting and hold it for 30 seconds (or as long as it takes you to sing Jingle Bells). Squeeze more frosting onto the top of the Half & Half carton. Place a graham cracker square on each side, making the roof of the house. Cut a graham cracker square in half to make a triangle. Frost one side of the cracker and place it on the part of the roof you haven't covered yet. Make sure the graham crackers are sticking well and aren't going to fall off when they're decorated. Decorate! Have fun! Get creative!